The most significant difference between the LED and diode is that the LED emits the light while the diode allows the current to flow only in one direction and opposes the flow in the opposite direction. The other differences between the diode and LED are shown below in the comparison chart. The LED is a type of diode which is made of Germanium arsenide or Germanium phosphide. The Germanium Arsenide has the property of emitting the light when their electrons of conduction band give energy to the holes of the valence band. 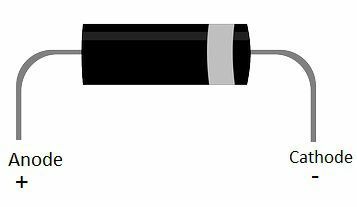 The diode is used in the electrical circuit for affecting the electric current. Their electrons of conduction band give energy in the form of heat to the holes of the valence band. Definition The type of diode which when placed in an electric field emits light. It is a semiconductor diode which conducts only in one direction. Principle Converts energy into light. Converts energy into heat. On-state voltage range 1.2v – 2.0v 0.7v for silicon and 0.3v for germanium. Uses Indicators in seven segment displays, use as light source. Rectifiers, voltage multipliers, clamping, etc. 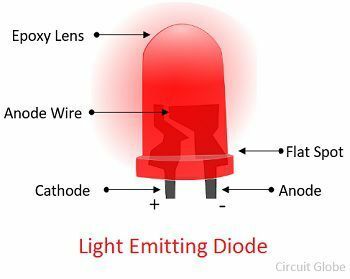 The diode which emits light during the conduction is known as the light emitting diode or LED. It works on the phenomenon of the electro-luminance in which the semiconductor material emits light when placed under the influence of the electric field. When the forward biasing is applied across the semiconductor material the free electrons crosses the N-region and enters into the P-region. In p-region, the holes are the majority charge carrier. The free electrons are in the conduction band and the holes are in the valence band i.e., the electrons have the high energy level and the holes have low energy level. The electrons and holes are recombined only when they have the same energy. For recombination, the electrons give the energy to the holes. They give energy in the form of the photons or light. Therefore, the LED emits light in the forward biasing. The semiconductor material (silicon and germanium) transfer energy in the form of heat. While the GaP and GaAs give their energy in the form of light. i.,e the GaAs and GaP are used for making the LED. In reverse bias, the LED emits no lights. The LEDs has many advantages likes smaller in size, requires less power, available in different colour, requires less area, requires low DC Power etc. The only drawback of the LED is that they get easily damaged by the overvoltage or overcurrent. The diode is a two terminal semiconductor device which consists the n-type and p-type semiconductor material. These material are connected together. The diode allows current to flows only in one direction i.e., from the anode to cathode. As the diode conducts current only in one direction so it is used as a rectifier. The diode behaves like conductors when the small voltage is applied to it. The current causes the voltage drop across the diode. The diode is a semiconductor device which conducts only in one direction. While the LED is the type of diode which emits light. The diode is made of semiconductor material and the electrons of this material give their energy in the form of the heat. Whereas the LED is made of the gallium arsenide and gallium phosphide whose electrons emit light while transferring the energy. The diode converts the alternating current into the direct current, whereas the led converts the voltage into the light. The diode has high reverse breakdown voltage while the LED has the low reverse breakdown voltage. The reverse breakdown voltage is the voltage that allows current to conducts in the reverse bias. In the diode, the on-state voltage is 0.7v in case of silicon and 0.3v in case of germanium. Whereas in LED the on-state voltage is approximately lies between 1.2 to 2.0 V.
The diode rectifies the alternating current while the LED display the light. The LED is used in the automotive headlamps, traffic signals, camera flashes, in medical devices etc. While the diode is used in clipping and clamping circuit, voltage rectifiers, voltage multipliers. The LED and diode is made of different material, thereby they have different properties. The diode is made of silicon or germanium, therefore, it gives energy in the form of heat. And the LED is made by gallium arsenide and gallium phosphide thus gives energy in the form of light.